We may well live in a brave new world of high-end handsets and data services now but some things never really change and, at Nokia World this week, we were treated to some more of these kinds of presentations, 2011 style. The difference today is that the execs are now saying they’ve met these perfect customers face to face. The person responsible for meeting these consumers is Nokia’s Blanca Juti, VP product marketing. Juti goes all over the world to find new people to sell phones to and we were introduced to three of them in her presentation. There was chatty Vivian in Beijing. There was Carla in Mexico, who never gets bored. And there was Francis, who lives in the Nairobi slums and has more than five hundred friends on Facebook. He wants a dual SIM phone so he can have a separate number for his girlfriends to call him on. Francis, like all of these young people, wants to grab the future with both hands and make it his. “Boy does this guy have aspiration!” said a beaming Juti. “He’s full of it!” He’s not the only one. This is the frothoccino, of course. It has to be done under the new Nokia regime. The tradition of Finnish modesty is out, along with the tradition of Finnish executives. But there’s solid thinking and what looks like real commitment under all the happy-clappy stage antics (Juti actually did a dance). 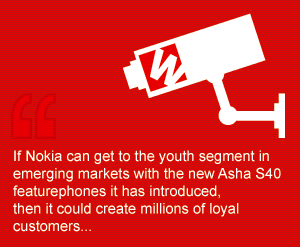 If Nokia can get to the youth segment in emerging markets with the new Asha S40 featurephones that Juti was introducing, then it could create millions of loyal customers; customers who will go on to buy more Nokia handsets. This, after all, is what Nokia did with unparalleled success the first time around. Juti said that, in Pakistan, 23 per cent of the buyers of Nokia’s X201 S40 QWERTY handset are first time internet users. This is the action that Nokia wants a slice of and, for Gartner analyst Carolina Milanese at least, it is the only vendor going at this market with a truly tailored approach. While Apple is gambling that once the disposable income of people like Francis reaches a certain point their aspirations will lift them onto the likes of the iPhone, Nokia is going after them early in the hope that they’ll graduate to the Lumia800, the WP7 handset that is Nokia’s new flagship in the high end. This was what everyone at NokiaWorld wanted to see and hats off to Nokia for getting it out before November, having only taken Microsoft’s hand at the beginning of this year. There’s been a great deal of speculation about the extent to which Microsoft is subsidising Nokia’s smartphone rebirth (it has after all been pointed out that ‘lumia’ is a Spanish colloquialism for prostitute. Much amusement will be had in Barcelona no doubt and they did so well researching the nomenclature for the ‘Asha’ portfolio) and it certainly got its money’s worth during Kevin Shields’ presentation, which wasn’t so much a demo of the Lumia800 as a demo of Mango. And Shields, who heads up Nokia’s smartphone play these days, made it look very good indeed. He also channelled Steve Ballmer with some pretty silly shouting about how AWESOME the phone is. Nokia may say it wants to be different, but what it really wants is to be more like Apple, the company famous for ‘thinking different’. That’s why we got a lot of talk about high-grade industrial design. That’s why we got lots of whooping from people in the audience who were probably tasked with that very whooping. And that’s why we got executives talking about “awesomeness” and “amazingness”. The Informer doesn’t know what Elop gives his team in the huddle before they take the stage. But it certainly gets them up. For the Informer’s money, it can only be a good thing that Nokia is back in the game at the top end. Three platforms for consumers to choose from is better than two and Nokia’s utter dependence on Microsoft will do a lot more for WP7 than the rest of the software player’s handset partners combined; hooked as most of them now are on Android. Welcome back, Nokia. And goodbye, Ericsson. If Stephen Elop looked pumped to see Nokia back, Hans Vestberg, Ericsson’s CEO, looked happy to be leaving the party. The Swedish vendor called a last minute press conference – a call to the Informer at 7.23am inviting him to the 10am meeting – with Sony (Vestberg was seated beside Howard Stringer) to announce that the Japanese vendor is buying Ericsson out of their handset JV for €1.05bn. It’s not unexpected and, despite Ericsson’s repeated assertions in recent years that it wanted to get Sony Ericsson into shape, the firm’s involvement as a stakeholder hasn’t made sense for some time. The timing of the press conference, while every handset analyst in the industry was at Nokia World, seemed selected to keep it as low key as possible. There was nobody from Sony Ericsson to talk about future plans and when the two CEOs were asked how Sony Ericsson would differentiate in the future, a smile of genuine relief lit up Vestberg’s face as he demurred to Stringer. That must be a weight off. It’s going to be a handset heavy issue this week, so we may as well get stuck in. Timely given the Nokia and Sony news that consumers are now prioritising mobile operating systems more than ever in their purchasing decisions, which puts brand loyalty on the hardware side in jeopardy. Research from Kantar Worldpanel ComTech shows that customers’ broader familiarity with the OS market is increasing at a fast pace, and operating systems are now almost on an equal footing with the handset brand for customers choosing a smartphone. Today, 18 per cent of people now decide on a smartphone based solely upon the OS, up from 12 per cent six months previously. Only 20 per cent, meanwhile, make a decision based on hardware brands, down from 27per cent. And 50 per cent of customers now consider both factors when choosing a smartphone. There’s that little green guy working his magic again. The Informer is slightly surprised he’s not seen cuddly Android toys in the shops for Christmas. Android is working its magic for Samsung, which overtook Apple to become the world’s biggest seller of smartphones between July and September, according to crystal ball gazers Strategy Analytics. Samsung sold 27.8 million smartphones in the three month period, compared with 17.1 million from Apple and 16.8 million from Nokia. Apple’s growth was hindered by customers waiting for the launch of the iPhone 4S. Meanwhile, number four slot in the smartphone space was taken by Chinese firm ZTE – more on these guys later. The Informer can’t help but wonder whether adoption of the iPhone 4S might be affected by Siri’s seeming inability to understand varoius non-English and regional accents. Since the device’s launch a swathe of humorous videos have appeared highlighting the application’s patronising response: “I don’t know what you mean by…” which the Informer suspects will become the new “Unexpected item in bagging area”. Ever the entrepreneur, Dag Kittlaus, co-founder of Siri and CEO of the company when it was snapped up by Apple for somewhere in the region of $200m last year, has jumped ship. It is reported that he parted with Apple on amicable terms and wants to turn his attention to a new project. This guy is definitely one to keep an eye on. Canadian BlackBerry vendor RIM has had its eye on digital content services provider NewBay for some time, this week marking the vendor’s fifth acquisition of 2011. RIM has already acquired cloud-based video editing services provider JayCut, mobile social gaming firm Scoreloop, cloud-based calendar and scheduling services provider Tungle.me and contacts management startup Gist, this year, but is this spending of the moolah putting RIM off its core activities? Still reeling from the recent outage, RIM has now delayed the next version of its PlayBook operating system until February next year. Ah, the old MWC deadline rears its head again. The BlackBerry maker said it will not launch the PlayBook OS 2.0 until it is confident it has fully met the expectations of its developers, enterprise customers and end-users. The PlayBook BBM application is also delayed until the next PlayBook OS release too. In a similar vein, let’s have a quick round up of this week’s financials: Carrier and parent of Orange and T-Mobile UK, Everything Everywhere has posted lower revenue for the third quarter of 2011 compared with the same period last year, citing regulatory cuts as the reason for the drop. The UK venture owned by France Telecom and Deutsche Telekom, reported revenue of £1.69bn ($2.72bn); 4.3 per cent less than what it made in 3Q10, and saw a net fall in customer numbers, losing 227,000 pre-paid users over the quarter. However, this rate of customer losses is less than previous quarters, suggesting that the customer base is beginning to stabilise. Dario Talmesio, principal analyst – head of Europe at Informa Telecoms & Media said that the results matched his expectations. “Overall, the results were broadly in line with what we expected and what we expect to see from the overall market this year.” He added that the firm is still adjusting to the merger between T-Mobile and Orange, and is beginning to form its identity. Motorola Solutions – the enterprise bit – said total sales climbed ten per cent year on year to $2.1bn, while operating earnings were up 24 per cent to $358m. For the Mobility bit, which is being absorbed by Google, Motorola reported net revenues of $3.259bn, for the third quarter, up from $2.9bn the previous year. Net loss for the quarter shrank slightly, to $32m, down from $34m a year ago. The two parties are still waiting for antitrust clearance, which would hopefully see an end to the uninspired launch of countless iterations of the RAZR. The Informer has lost track of which version we’re on. Eight? Ten? 40? Whatever the case, an LTE version was announced just recently. Still, to be fair, we are letting Apple get away with a similar trick. There might be more trouble on the Android ranch as well, as Microsoft stands to make even more money out of every Android or Chrome-based device after the firm signed an agreement with Taiwanese manufacturer Compal Electronics, which handles the production of notebooks, monitors, and televisions for a variety of firms around the world, including Acer, Dell, Toshiba, HP and Fujitsu Siemens. As a result of the licensing deal, Microsoft now has more than half of the worldwide ODMs for Android and ChromeOS devices paying it patent royalties. The US firm has not publicly stated which of its patents are allegedly infringed by Android and Chrome and Microsoft officials have insisted that OEMs and ODMs sign non-disclosure statements before sharing with them the details about their alleged infringements. Is this all getting a bit ridiculous? Next thing Apple will be awarded a patent for unlocking touch screen devices with a swiping gesture. What’s that you say? It already has? Oh dear. Susan sounds like the type that somehow likes to be led around by the nose electronically. Parts of this future are very dark, sorry…reminds me of an old episode of a sci-fi show, with the ever-present Norman guiding the flock by “serving” them. It won’t be long before Microsoft is fighting patent battles for Android for fear of ruining a great revenue stream. Maybe some time after this we will see a patent with some actual validity. impressive of Nokia.its crazy how the Apple revolution has sparked a healthy competition in the bid to make products smarter &user-friendly.Nokia was a god in this market until they started losing edge.they sound ambitious.The flexibility of the windows phone Os will make a big difference in their entire smartphone strategy.